Honor Flight Bluegrass sole mission is to fly our heroes to Washington, DC to visit their respective memorials and reflect upon their service, sacrifices, and memories. Every service member, regardless of branch, deserves a THANK YOU and a WELCOME HOME in the first class and grandest style ever. Honor Flight Bluegrass honors our heroes, recognizes their sacrifices, and takes extreme pride with our unwavering gratitude and utmost respect to provide this service to World War II, Korean, and Vietnam veterans who served during that time. 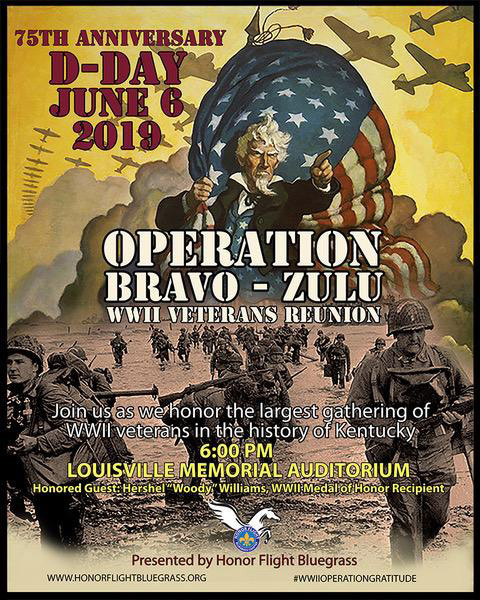 Bravo-Zulu 75 Years Later... Be Part Of It! If You Know A WWII Veteran, Want To Volunteer, Or Want To Sponsor.... Please Call 859-433-6495. Honor Flight Bluegrass is in need of supplies!